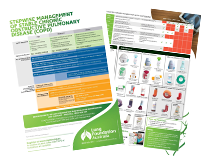 COPD Guidelines: The COPD-X plan Version 2.56, December 2018 Lung Foundation Australia’s COPD Guidelines Committee, manages the co-branded Lung Foundation and Thoracic Society of Australia and New Zealand’s, “The COPD-X Plan: Australian and New Zealand guidelines for the management of chronic obstructive pulmonary disease”. To ensure you stay up-to-date with these guidelines, register below. Single page translation of the non-pharmacological and pharmacological therapies across the disease severities. New table to guide addition of therapies on the reverse! 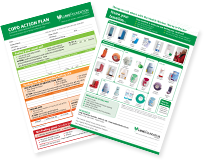 This action plan is for completion by the clinician in consultation with the patient. It helps the patient recognise when their symptoms worsen and what action they need to take to manage them. Algorithm - Managing COPD Exacerbations in Primary Care. 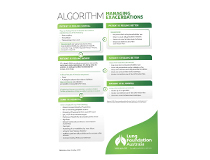 This algorithm provides health professionals with clear step-by-step instructions on how to manage COPD exacerbations and identifies when to refer to hospital. This is an online decision support tool, specially developed to summarise COPD-X Guidelines, including a spirometry calculator and lung age estimator. This supports primary care practitioners in diagnosis and management of COPD.